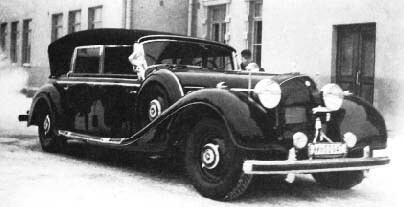 Mannerheim's Mercedes Benz 770 F-Cabriolet, which was also called Grosser Mercedes Offener Tourenwagen, was one of the most expensive and exclusive cars of the era. It is a 4,000-kilo, 230-horsepower armoured colossus, reaching the speed of 170 kilometres per hour. It was brought to Finland via Vaasa in December 1941, and delivered to the receiver in Mikkeli on 16 December, 1941. Contrary to allegations made in public, the Mercedes was not Hitler's birthday present to Mannerheim. On his 75th birthday ond June 4, 1942, the Marshal was given three brand new Steyr jeeps as a present from Hitler. As regards the armouring of the automobile, it is worth mentioning that the floor was made of 5.5-6 millimetre thick, and the other sheet metal parts of 3-millimetre thick specially hardened steel so that the automobile was strong enough to resist the explosion of small mines or the firing of light weapons in use at the time.The windows were made of 40-millimetre bulletproof material. The inside of the Mercedes was luxurious. It was upholstered with leather with pull-up elbow rests between the seats. Three additional pull-up seats were fastened behind the front seats, which enabled the automobile to seat as many as nine passengers. The fuel consumption was 27 litres per a hundred kilometres which required a large fuel tank holding 197 litres. The fuel, synthetic petrol, was imported from Germany specifically for this automobile. The car was in frequent use, and not only for representative purposes. When the road conditions were favourable the car was also used for commuting. In August 1944 Mannerheim was elected President of the Republic. He arrived at the inauguration in his sedan V12 Packard, not in his Mercedes any more. This may have been a sign of the change in the attitude towards the Germans. The Mercedes had always been associated with its donator, Adolf Hitler. Although the Mercedes was one of Mannerheim's favourite automobiles, he avoided using it during his stay in the president's office for reasons of foreign policy. The car remained in the garage throughout his term in the office. In late 1946, after resigning from presidency for reasons of health, he decided to sell the car to Sweden. Servicing and driving the Mercedes was incredibly expensive in post-war Finland hampered by the shortage of goods. Furthermore, it would have been impossible to use it for political reasons and knowing the background history of the car. Consequently, it was hauled to Stockholm by ship, and afterwards there are several observations of the car in the world. In Sweden the car changed owners several times within a short period of time and in 1948 a Swedish enterprise used it as a payment of a loan by selling it to the United States, where its historical value was made use of in different connections, for example in the film about Rommel (1951) in which it appeared as Hitler's automobile. In 1973 the car came into public notice again when it was sold in an automobile auction in Arizona as Hitler's Mercedes at a record price of 153,000 dollars (about 3.5 million current Finnmarks). Half a year later, it changed owners again at a record price of about 4,5 million current Finnmarks. On 13 January, 1973, the Finnish news agency STT informed the news agencies of the world that the automobile had belonged to the Marshal of Finland, not to Hitler. This piece of news was quietly ignored and the car frequently changed owners due to its reputation. By the middle of the 1990s the car had become the property of a former US army general who had a private automobile collection, and it was restored to its original condition. Mercedes Benz 770 F-Cabriolet and the V12 Packard.